Ever heard of the Mozart effect? The term speaks to the phenomenon whereby one’s IQ improves following exposure to a few of Wolfgang’s strains, as if a trace of the composer’s genius were transferrable to his listener through the medium of music. Arguably, the effect has been scientifically proven. It doesn’t take a genius to gather that a similar effect is observed wherever running and, say, that modern master of the pop collage known as Beck meet (the “Beck Effect” has a nice ring, I think). 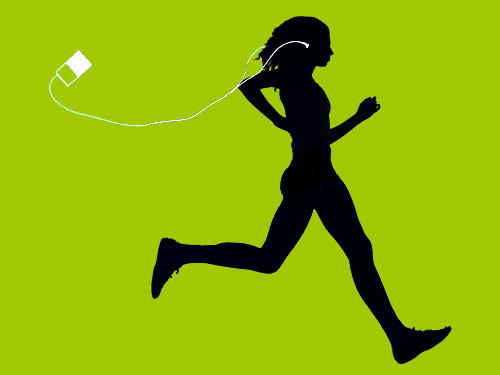 Such pairings have been known by iPod-using runners to improve running performance–without elevating red blood cell count. Win, win. We all march, as the saying has it, to the beat of a different drummer. (For me, an amateur bassist, the bassist is my drummer). This makes the very idea of a perfect running playlist suspect. The perfect playlist is admittedly personal. And it is admittedly fleeting. Of course musical tastes and music catalogs change over time, but usually long before they’ve had the chance to morph much, our brains have long since grown immune to yesterday’s perfect stimuli. What lit a fire under us and made our molecules all wiggly last week may have all the effect of soggy newsprint under a pot of tepid water this week. Even one’s approach to compiling the playlist is personal. Playlist-making methodologies are as diverse as the runners who employ them. Here are a few approaches with which I have been acquainted. 1.) What’s in a name: Here, one looks for the words run or running in the song title: “It keeps you Running.” “Running with the Devil.” “Miles Runs the Voodoo Down.” “Running on Empty.” “Born to Run.” You get it. Personally, I don’t see how such a loose collection of songs whose only claim to relatedness is a three letter word (or its verb form) can be of much value to one in need of audio adrenaline. 3.) Poetry in motion: One may select pieces of sweeping lyrical or musical beauty in the hope that they will calm the nervous system, freeing the runner to more fully experience his or her run. In this case, peak performance is probably not the objective. Peak enjoyment is. In this frame of mind, my favorite piece is “The Moldau” by classical composer Bedrich Smetana. 4.) The mathematician: While I have not met him or her, I have heard of runners who strive to carefully match the timing of songs to their running cadence. That is too much math for me. Here’s a playlist of my own (using none of the above methods), made up of songs that I’ve personally road tested over months or years. Included is some insight into the rationale behind the selections. By employing similar rationale, you may be able to compose the playlist that gives your training that extra push or gets you through that slog of a long run (you know we all have them). Tip: Compile multiple playlists and cycle through them to avoid burnout. Cake, “Going the Distance”: Sure it’s about an overachieving wage-slave, but with a beat like that, who’s hearing the irony? “No trophy, no flowers, no flashbulbs, no wine. He’s haunted by something he cannot define.” That about sums up the recreational runner. Beck, “Novocain”: Feels like musical dubbing for a documentary about an extreme sport like base jumping. Makes me want to sport a mohawk and day-glow wrap-around Oakleys. Good thing the feeling wears off, right? CCR, “Chooglin”: My nod to classic rock. Metronomic timing. Biting harmonica all day. Nearly long enough to see Ryan Hall through a 5k. Makes me feel like I’m keeping pace with a train (like in that Superman movie). I’m not running, I’m chooglin—whatever that is. BHS, “Pepper”: “…like an avalanche coming down a mountain…” That’s me—visualize. Sublime, “Burritos”: Forget the name, remember the bass line. Frenetic. Infectious. A bassist’s equivalent to running a four minute mile. Rage Against the Machine, “Tire me”: A song whose every measure screams, “I dare you to mess with me!” Includes the line, “Why don’t you get from in front of me?“ Poor grammar but a great mantra for picking off that runner you’ve been trying to reel in for the past mile. Sting, “She’s Too Good For Me:” This is when a walking bass line becomes a running bass line. Warning: It could be embarrassing—and bad for your form–when you catch yourself playing air bass. Miles Davis, “Fat time Groove.” A real tension builder. Time your explosive finish with a guitar solo that makes your favorite rock solo sound like junior playing at Guitar Hero. The solo riffs for about four minutes, so pace yourself accordingly. Finally, I don’t recommend any song that incorporates sirens or barking dogs; such sounds can be very, um, disconcerting. And of course, give your friend the iPod a break now and then, and commune with your own thoughts and with nature.